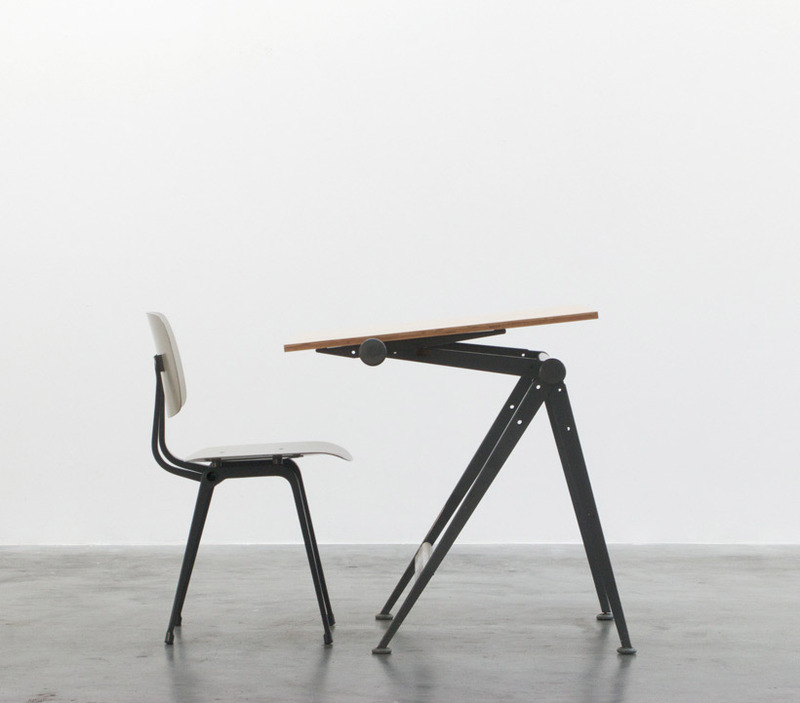 Drafting table Reply designed by Wim Rietveld and Friso Kramer Revolt chair, period 1956. Inspired by Jean Prouvé. The table can be adjusted in height. Can be used as office desk or as architect table. Table top has been renewed with multiplex. Wim Rietveld received for the design of the drafting table in Brussels the 'Golden Sign' or 'Signe d'Or'. Table de rédaction modèle Reply conçu par Wim Rietveld et chaise Revolt Friso Kramer, période 1956. Inspire par Jean Prouvé. La table peut être ajuste en hauteur et peut être utilisée comme bureau ou sinon comme table de dessin. La tablette et en multiplex. Wim Rietveld a reçu le 'Signe d'Or' a Bruxelles pour la table de rédaction 'Reply'.